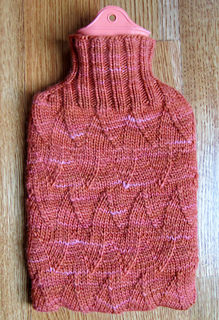 The Flame Wave stitch pattern adds texture and visual warmth to a simple hot water bottle cover, while maintaining a single layer of fabric (unlike knitted covers adorned with cables), allowing heat to radiate evenly. Directions for Flame Wave pattern are given in chart form. Worked from the bottom up in the round and seamed on the bottom. To insert the water bottle into the cover, fold the empty bottle in half lengthwise.